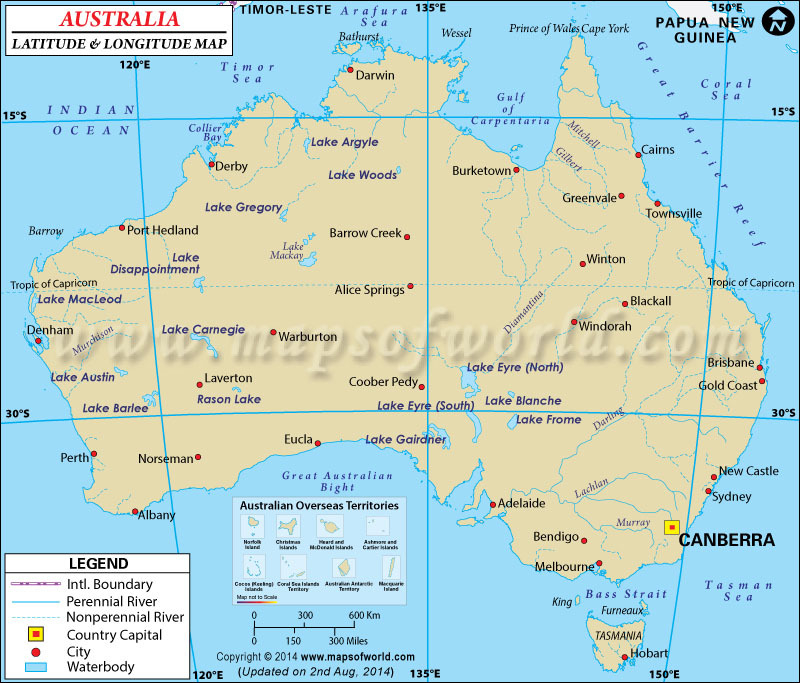 Australia's latitude and longitude is 27° 00' S and 133° 00' E. It has given it a particular type of arid climatic country. The Commonwealth of Australia is located on the geographic coordinates of 25.0000° S latitude and 135.0000° E longitude in Australia. Australia, the smallest among the continents of the world, is located in between 27°00' South Latitude and 133°00' East Longitude. Some of Australia 's major cities are located in slightly different latitude and longitudinal areas. Melbourne in Australia is situated in between 37°49' South Latitude and 144° 58' East Longitude. Similarly, Adelaide's latitude and longitude are 34° 56'. Australia 's latitude and longitude has given it a particular type of climate. In the south and eastern part of Australia the weather is generally temperate where summer and winter climate is not marked by extremities and is enjoyable. But in the northern part of Australia the climate is very hot and humid during summer and cold in winter. Rainfall is also very moderate in Australia making it an arid climatic country.